The Windows Task Manager (Core Windows Tools) | ComTek Computer Services Inc. 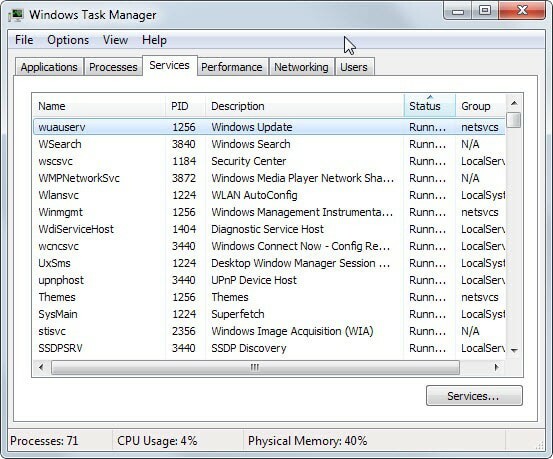 The Windows Task Manager is one of the core programs that ships with every version of the Windows operating system. Designed to provide users with an overview of what is running and happening on the system, it is considered an advanced tool by many. The Task Manager is more or less identical on Windows 7 and earlier versions of Windows while it has changed in Windows 8 and newer versions. So how do you start the Task Manager on your system? Probably the easiest and most common option is to use Ctrl-Shift-Esc to do so. This opens the Task Manager right away on the desktop. There are however other options to open the Task Manager (not all may be available in all Windows versions). Right-click on the taskbar and select (Start) Task Manager. Use Windows-r to bring up the run box, type taskmgr and hit enter. Press Ctrl-Shift-Del and on the screen that pops up (Start) Task Manager. Check the cpu load and memory usage of the system or individual programs running on it. Find out which processes are running on the system. The task manager displays the running processes under the current user account on run on Windows 7 and earlier, and all running apps on Windows 8 and later on start. Windows 8 users can click or tap on more details to display the running processes as well. Each process is listed with its name, cpu and memory load, user account it is running under and description by default. It is possible to add information to the table, for instance the process ID or I/O reads or writes. Check out this guide that explains how to do so in detail. Open File Location - This opens the file's location in the default file manager, usually Windows Explorer or File Explorer. End Process or End Process Tree - This terminates the selected process or the selected process and all other processes that it has started directly or indirectly. Useful if you cannot close a program window on the system the usual ways for example. A tap on the Del key while a process is selected has the same effect as End Process. Set Priority - This changes the priority of the process for as long as it is running. You need to use third-party tools if you want to modify the priority of a process permanently. Set Affinity - Force the selected process to use only select processor cores instead of all of them. This too is only valid for as long as the process is running. Properties - Opens the properties dialog window of the selected file. Search Online (Windows 8+) - Runs a search for the process in the default browser and search engine. Processes can be sorted with a click on a table header. It is for instance possible to sort processes by cpu or memory use which can provide you with information on which processes use the most system resources. The button "Show processes from all users" restarts the Windows Task Manager to display processes that are not run by the user account but by other users on the system. A click on the performance tab displays performance related information including the current cpu and memory usage as well as the history, and additional information such as the available memory or the total number of processes, threads and handles. Related to that is the networking tab which displays the network utilization. Microsoft has merged network and performance under Windows 8 so that the information are displayed on the same screen. 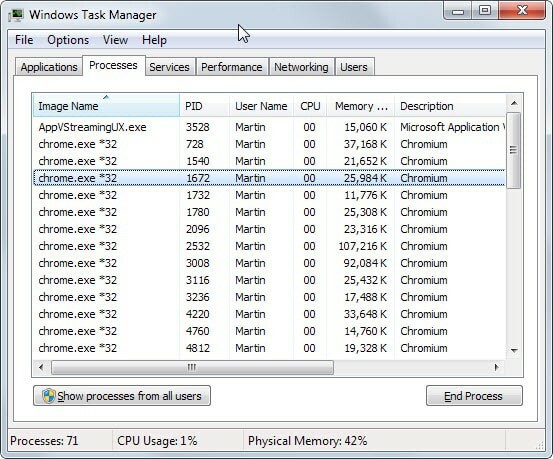 The third and final major component of the task manager is the services tab. It lists all services and their state, and provides options to start and stop services right from there. The button services opens the Services manager of the operating system. 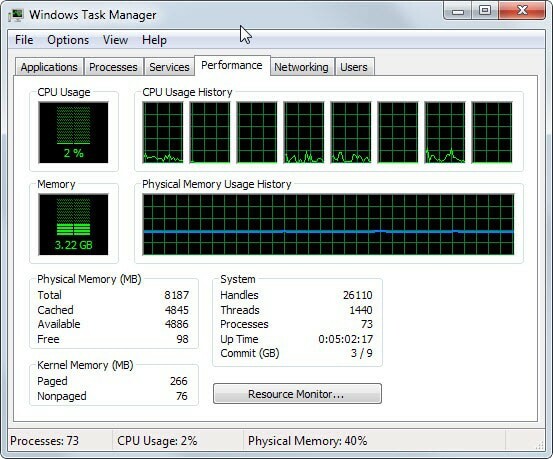 Windows 8 ships with three additional tabs in the task manager. The first displays items that are loaded on start. This is limited to programs though. Options are available to disable the program so that it won't be loaded on system start. App History lists all apps that have been started on a system in the past 14 day period. The apps' cpu time and network utilization are listed on the page. Details finally is a detailed processes listing that offers additional information about each process.